It really amazes me how people continue on with their own busy schedules that they forget to “Stop and smell the roses” sometimes. I understand that life is hard and that we all have lives to live but sometimes being able to be wary of your surroundings and all that is happening in it that can really make a difference in you every day lives. The reason why I say this is because of the fact that I almost missed something beautiful today. As I stated in my last post, today I encountered an amazing musician playing one of the most amazing and soothing instruments I’ve ever heard. But as I came back to reality after escaping into a world of sereneness, I noticed so many people just continuing on with their lives as if nothing was there to begin with. I might be over exaggerating a little, or maybe it’s because I made myself wary of the fact that music exists all around London. And I’m not talking about the House Music that is blasted from the night clubs or the radios of passing cars, but the multitude of musicians that occupy and share their talents with the London world. From harpists to guitarists, to vocalists and more, London is so lively with music, something that I’m not so used to. And these musicians…they sure have amazing talent. Sometimes, I’m so tempted to stop and sing along to familiar tunes they are playing but what stops me is the thought of how they’re putting so much on the line, they’re making themselves so vulnerable that even I’m not brave enough to face what they are brave enough to do. If only I can be as courageous as them. Have You Ever Heard the Harp? There’s just something about the musical harp that makes me so relaxed. From the plucking of the strings, the harp emits a serene sound that, for some reason, soothes my soul. No matter what song is played on the harp, the tonality of its melodic tune seems to give off a sense of comfort, a sense of tranquility that it feels as if I were getting a full body massage and my whole, soul all of a sudden, falls into a deep relaxing sensation that all burdens, all cares just seem to float away. But the harp isn’t one of those ordinary instruments that you see so many people playing. 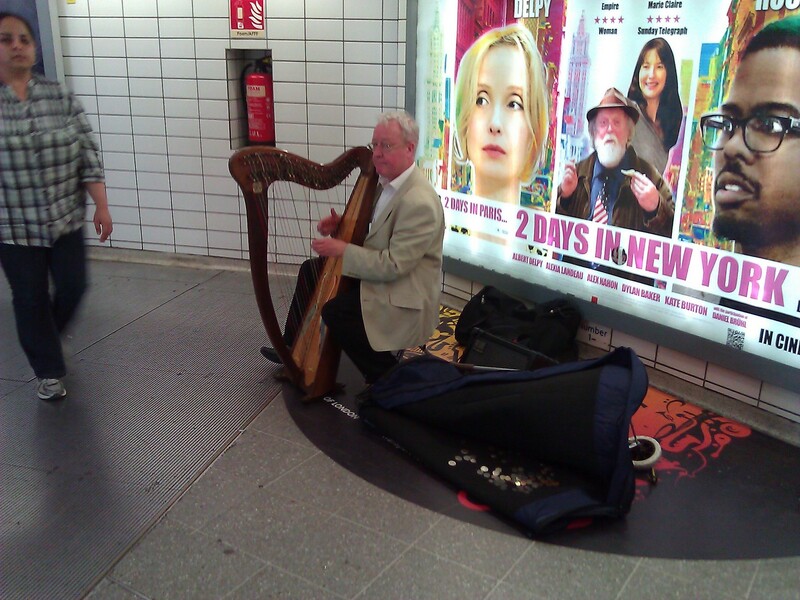 And it definitely puzzles me to see a harpist playing music as I take to the tube stations of London. Seeing a harpist playing serene songs as I rush to get on the tube to reach my next destination creates an unusually experience for me, an experience I know I’ll never forget. As I made my way to the Leicester Square tube station from the King’s Cross St. Pancras station, I come to a surprise of seeing a harpist playing his instrument. And it isn’t any random song that i don’t know that I hear him playing. No, the song is very familiar to me. The song this harpist is playing is My Heart Will Go On by Celine Dion. This song that’s become famous after the movie, Titanic, is being played at the Leicester Tube Station. And all I can do is stop and appreciate this beautiful song as each string on the harp is plucked in an amazing way that I, myself, cannot explain. I, all of a sudden, feel moved by the music and become almost entranced by the melodic tune that it brings back so many different memories of when I was younger and I heard the song for the first time. It almost feels so unreal to me. This harpist at the Leicester Tube Station is playing. And I know I’ve seen him a few times before playing in the same spot at the same station, but for the first time, I become so fascinated by how he plays that it makes me a little envious that he creates such a beautiful and serene sound that my voice can not even come close to making. If the harp can create such a beautiful sound, then it makes me want to work even harder to transform my own voice to create the same instilling sensation. And it’s because of this experience that makes me appreciate how amazing the harp really is and how, even in a busy world, a harp can create a relaxing atmosphere that can make me forget about all the stress and all the worries I carry on my back each and every day. As I walk around London (mainly to get familiar with my surroundings after leaving my own comfort zone which I called home for 22 years-the Bay Area of Northern California), I become amazed by the various people that walk the streets. 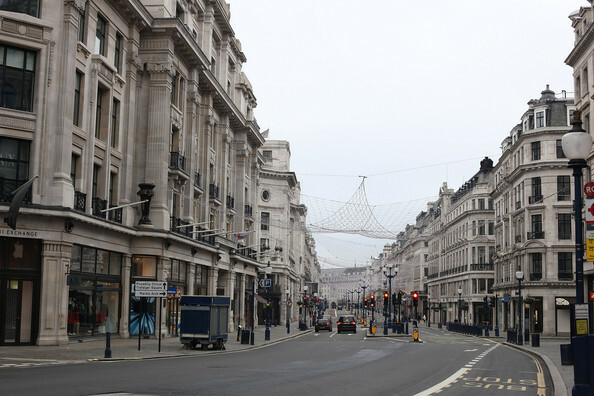 With so many people from all walks of life roaming the streets of London, it truly is remarkable that all these people can cohabitate in the Europe city. It almost reminds me of the United States is, more specifically San Francisco, CA and how a diverse population of people co-exists in that California hub. But what amazes me more is the amount of talent that exists on the streets of London. And when I talk about talent, I mean the number of musically talented individuals who perform on the streets of London, in the numerous tube stations, etc. These individuals have amazing talents, amazing gifts that most people overlook as passerbyers end up walking past them as if they don’t exist. But I notice them. I notice the amazing musical talents that these performers have and even more so, I want to acknowledge the bravery these people emit as they leave themselves vulnerable performing on the streets. Singing has always been a passion of mine. From the age of 3, I’ve been immersed in a wide range of music, whether it be using musical instruments to make melodies and harmonies or it being me using my own voice to make music, music has always been a big part of my life. I’ve even had so many opportunities to perform on so many different stages within my own community and even perform for different sized audiences, both small and large. But I’ve never challenged myself to go outside my comfort zone to just sing on the streets and leave myself vulnerable to complete strangers who aren’t expecting to see experience random musical performances as they make their way to work or school. It takes a lot of bravery to do this and it is because of this bravery that I want to acknowledge these musical individuals. And it’s because of this lack of experience I have for not performing on the “street stage” that I feel I can learn so much from these individuals. Barry Bond, San Francisco Giants Major League Baseball Player, say it best the process of learning from others: “I never stop looking for things to try and make myself better.” And this is what I’m trying to do; expand on my own musicality by learning from so many others, especially those who experience performing for others in a way that I don’t feel comfortable doing myself. And it’s because of the musically talented that exists on the streets, especially within the streets of London, I feel I can learn so much from as long as I give them spotlight and allow them, at least just this once, to finally have their voices be heard and not end up being just another passerby-er experience that most people don’t even notice at all. It’s for these talented individuals, duos, trios, or even groups that it’s finally time to start a London Street Musical Expedition and finally uncover the hidden talents that are embedded within the streets of London.